Trail hunting wildlife camera should be reliable at all times. You don’t want to miss the great opportunities of capturing rare species of fox or deer right at your backyard or in the forest. There are lots of trusted brands when it comes to wildlife camera, each one of them showcases its own set of advantages and disadvantages. Choose the one that is most suitable for your lifestyle and personal preference. The BlazeVideo Trail Hunting Wildlife Scouting Game Camera is ideal for hunters who are looking for high-resolution images and sensitive motion sensor. It will let you grab the opportunities to shoot any moving object that it can detect or record clips of coyotes and rabbits. It also has an ample storage space to let you save all the videos and pictures that you’d want to view later on. 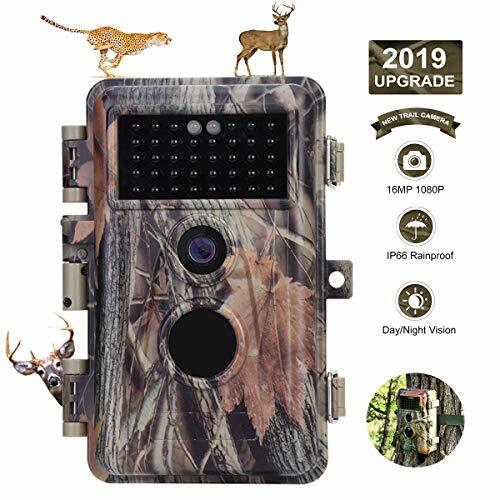 This trail hunting wildlife camera, as what we’ve mentioned above, generates 16 MP high-resolution images and records high-definition video (1280*720P). It’s highly sensitive Passive Infra-Red (PIR) sensor (PIR up to 60° detection angle) is perfect for leaving the trail camera for a few weeks or so inside the forest. Therefore, even if an animal or a human is about 65 feet away, as long as it is moving, the camera will detect the subject and shoot. It can accommodate SD card up to 32 GB, saving all pictures and videos automatically. It is also resistant to the harsh elements of nature, making it durable and ideal for shooting free animal roaming around the area. It can also be used as your home security camera or just monitoring the office building. The time lapse feature will allow the camera to take pictures with the specified interval automatically. It makes this trail camera perfect for observing snakes and other cold-blooded animals or simply shoot video of the process plants go through in flowering. You can also use the timer feature to modify its settings and record the video or picture you’d want to have at the end of the day. Other features such as time-lapse, interval recordings, timer, time interval, timestamp, and PIR sleep can help you shoot photos in a better angle and timing. Because of the password set and serial number function of the camera, aside from hiding it well in trees and bushes, you can fully protect your trail camera from being stolen by thieves. The serial number function, on the other hand, will help you to identify the location of the photos taken while you are reviewing them. While there are several useful features for great photo captures in this trail camera, you can rest assured that it is easy to operate. It can take full bright and colorful pictures during the daytime, and it generates clear monochrome pictures during the night time. The package includes a USB cable, making it easier for you to transfer and send the photos to your laptop or computer. The manual is easy to understand; you can set up the camera in just a few minutes even if you haven’t used a trail camera before. Aside from that, you can rest assured that the imaging components are well-protected from its harsh surroundings. The hard case of the trail camera has two lock buckles on it, securing the camera inside and hiding it at the same time. You can carry it around and set it up in various places and angles because of its portability. It provides the temperature, time, date, and moon phase of each picture. The LED screen is wide for you to view the pictures while you are in the field. There is a mounting hardware available for this trail camera. Therefore, you can use it with your tripod if you are not planning to leave it in the forest for too long. You are required to use the 8 AA batteries if you want a longer life of this trail camera, and you cannot find it along with the package. However, if you are planning to have a short expedition and just wanted to give it a try, then try the 4 AA batteries then. Just like any other camera, it requires SD card to function. Since you cannot find the SD card in the package, it will add to the extra fees you need to pay to use this trail camera. The base of the trail camera is not flat. Therefore you cannot rely on it to just stand by itself. You need to use the straps or tripod, or ropes to prop it up on a tree. It can also be complicated for you in setting up the tripod for the camera because instead of the bottom part of the back of the camera, you can find the mounting hole on the bottom front cover of the camera body. You need to be careful that it does not lose its balance while you are away. Considering the features that it can offer, the benefits, and even its own set of disadvantages, this camera is ideal for hunters who are just starting to shoot videos and take photos in the forest. You don’t need to buy complicated and expensive trail camera as it can suit your needs and use it like a pro. Both beginners and pros can utilize this trail camera through experimenting with the settings. For the price of this trail camera, for people who love hunting or you are just looking for a home security camera, it is worth investing.